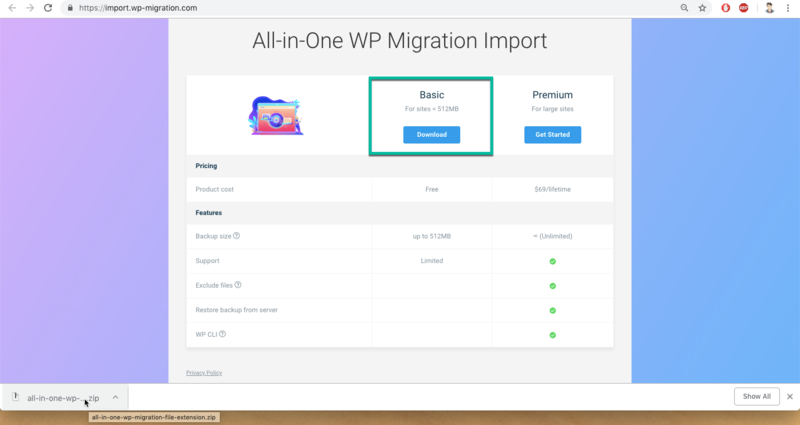 Our Free All-in-One WP Migration File Extension extends the functionality of the All-in-One WP migration plugin, connecting it to your Import from File Option in Import Site. This facilitates importing website/network of sites directly between your All-in-One WP Migration File Extension and your website. The tool works as an extension to the plugin. All-in-One WP Migration plugin is required to be installed in order to Import your WordPress backup successfully. 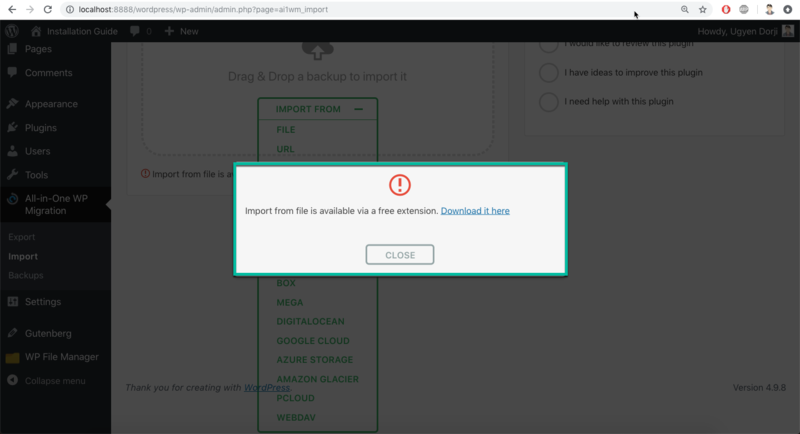 When you try to import you could see a notice in Import Site: Import from the file is available via a free extension. Download it here. 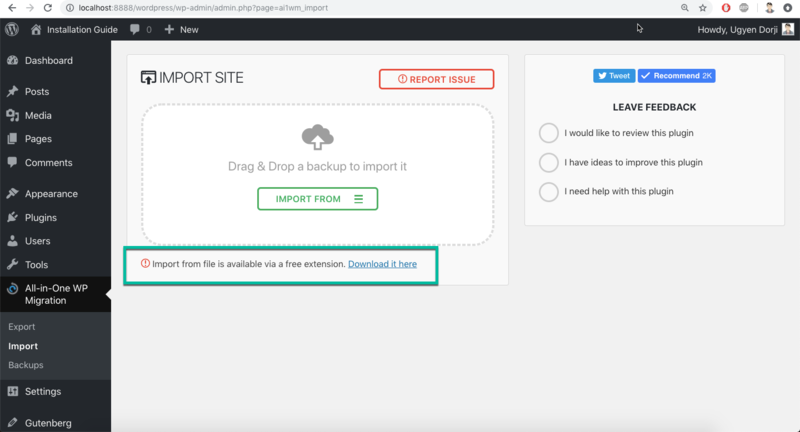 After activation of our All-in-One WP Migration File Extension, you could able to Import your WordPress backup with the maximum upload file size of 512MB. All options available from the dropdown menu, except ‘File’, should be used with a combination of All-in-One WP Migration plugin with a corresponding extension installed. For more information about available extensions please visit https://servmask.com/products. If you choose ‘File’, the plugin will open a window showing your local files and folders and will let you chose a backup for import from there. This option is very convenient if you have a backup which is not in Backups and you need it imported in an optimal manner. The import has an additional step which warns you that your website will be overwritten by the new backup including database, media, plugins and themes. This is the last step from which you can cancel the process. After pressing ‘Proceed’ you cannot stop the import process anymore. 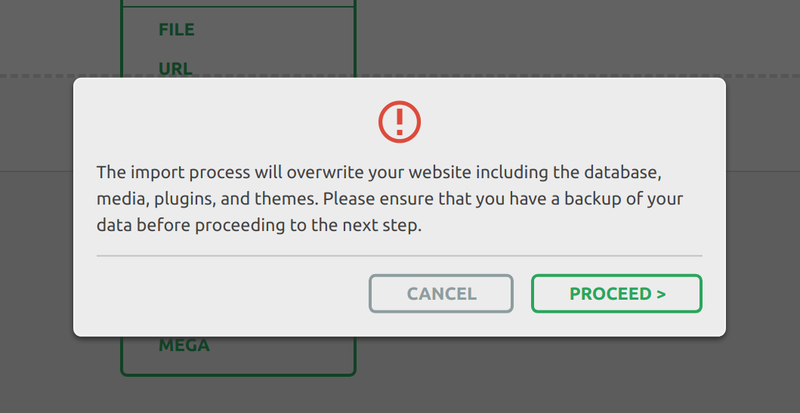 The amount of time the import process will take depends on the size of your website data. At this step, it is recommended to click on Permalinks Settings link and save your permalinks twice in order to save them and generate the .htaccess file. For more information about All-in-One WP Migration Unlimited Extension, please refer to https://servmask.com/products/unlimited-extension. Once you have migrated your site. You will need to log in with the username and password of the site that you imported. As a result, your users and passwords from the old site have been migrated to the new site. Therefore, you need to use these credentials. Your data has been imported successfully! The requested URL /wp-login.php?redirect_to=https%3A%2F%2Fremodelers.xffector.com%2Fwp-admin%2Foptions-permalink.php&reauth=1 was not found on this server. Are you using any plugin that changes your login page from /wp-admin to something else? Hello, I have a AWS EC2 server with a WP image. I also purchased the All-in-one Unlimited Extension. Even with the Unlimited plugin activated, I cannot import my 200Mb website. Can you please help here? Or is there a contact email? Please make sure the base plugin and Unlimited Extension are up to date – version 6.82 and 2.23, respectively. Hello, I have exported correctly from the origin. The destination WP is a completely clean installation. When trying to import the file does not advance of 0.0% and finally says that it could not be exported. What is your hosting provider? Could you reach out to us at support@servmask.com? My max upload is around 430 MB and my file being imported is 327. I recently updated the All in One WP MIgration plugin too, so that’s up to date. I have a screen cap of the error message. My staging site has almost no plugins active due to it being recently created. What is your hosting provider? Have you tried to install File Extension (Basic) from this page: https://import.wp-migration.com and import? I love the All in One Migration plugin. I use it all the time. I have a client that is hosting via Network Solutions and they are awful. My site export is about 470M and I’ve increased my php limits to accept this file. It gets to about 3-4% and stalls. I contacted Net Sol about it and they simply want me to hire one of their professionals to migrate the site. I said no way because when they did that the last time they installed a bunch of garbage along with WordPress. Anyone else have issues with Network Solutions and found a workaround? I hate going old school but looks like I’ll have to ftp all my files, then database, then import settings. What a pain. Man, I hate Network Solutions. Could you contact us at support@servmask.com? I have this extension but it’s not working? can you please help me to solve the issue? How is it not working?